Cryptojacking malware continues to spread across the web, largely due to the popularity of Coinhive. Since Coinhive’s launch in September 2017, numerous cryptojacking clones have come about. The tool I’ve chosen to locate them with is PublicWWW. 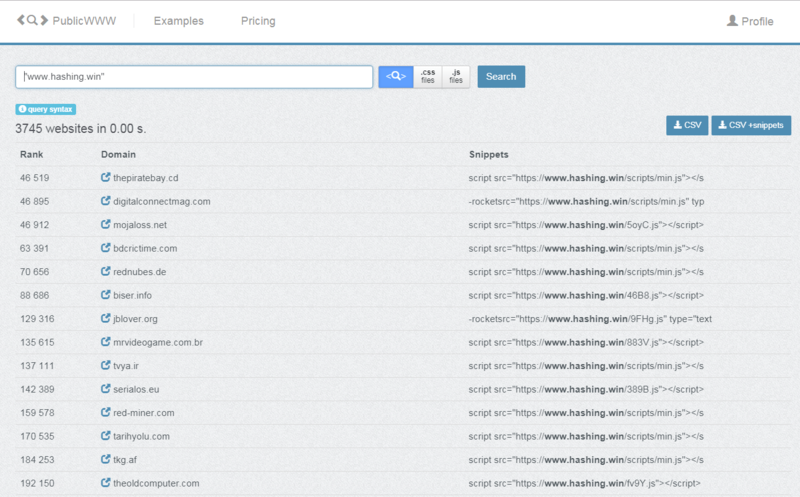 This is a search engine that indexes the entire source code of websites. 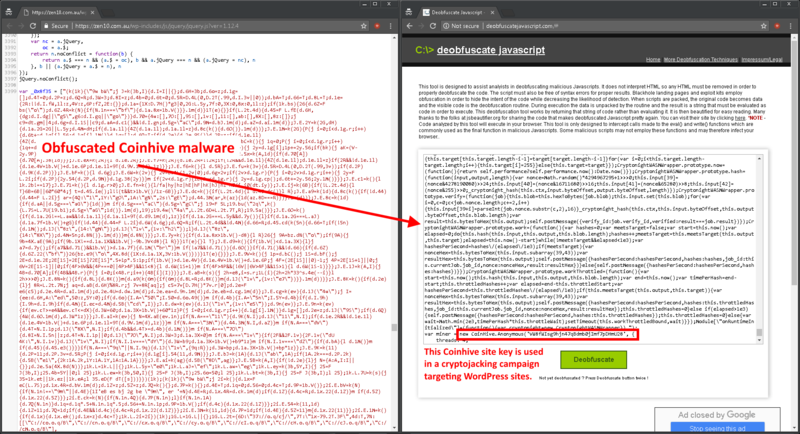 I previously offered a comparison of their dataset versus other providers in my discussion of Coinhive malware specifically. In this post, I detail how to find websites containing Coinhive, Crypto-Loot, CoinImp, and deepMiner in PublicWWW. Let’s jump in and see how many sites with cryptojacking malware we can find! Using this query, we find 34,474 sites. While this may seem like an astounding number, it’s only a modest increase since I wrote about the 30,000 sites found back in November 2017. Once the Coinhive site key is extracted, we can export the results and correlate which sites are part of a cryptojacking campaign. This correlation of a small number of Coinhive site keys to hundreds and even thousands of websites was documented in my previous post. In some cases the same Coinhive site key was associated to multiple functions, shown above. Crypto-Loot has steadily remained as one the most popular alternatives to Coinhive since its inception. Similar to Coinhive, Crypto-Loot doesn’t require any user interaction and can run steathlity in the background. This is a prominent feature on Crypto-Loot’s marketing page, in addition to DDoS protection which is provided by Cloudflare. 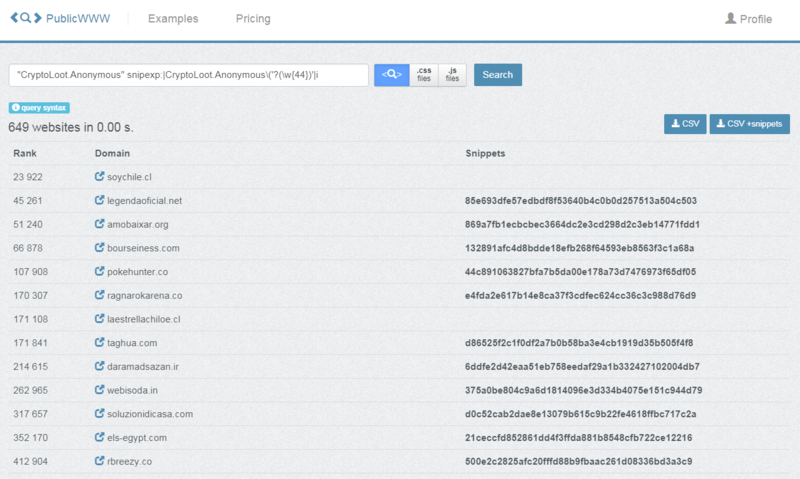 Searching for strictly the two domains used, we find a total of 2,057 sites with Crypto-Loot present. 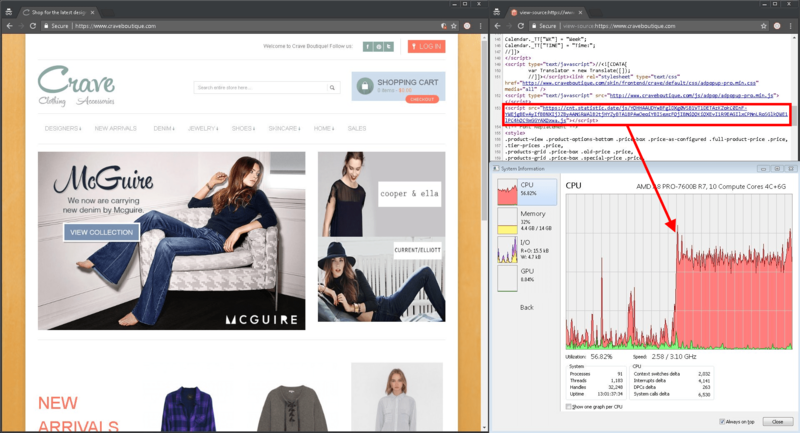 CoinImp is a relatively new player in the cryptojacking game, however a large increase in the number of sites where it has been seen has been found recently. Interestingly, the reference to “www.hashing.win” previously found in CoinImp’s documentation was quietly removed sometime after 2017-12-20 and replaced with “www.freecontent.bid” as the illustrative example. Screenshot captured of CoinImp’s documentation page on 2017-12-20. Coincidentally, the most used CoinImp domain name, www.hashing.win, has been found by PublicWWW on a whopping 3,745 sites. Since this was surprising number, I manually reviewed numerous sites and found that CoinImp had already been removed or another form of cryptojacking malware, such as Coinhive, had been placed. This leads me to believe the cryptojacking campaign perpetrator was using a short-lived method to place the CoinImp code. 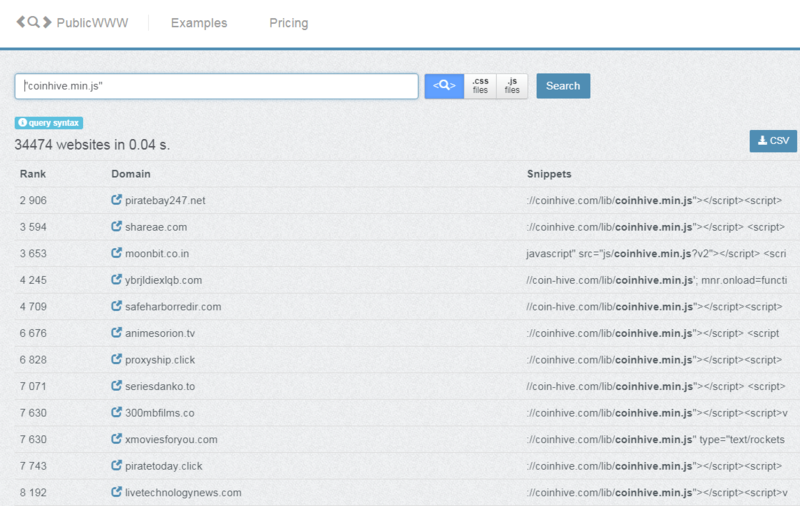 Totaling the four CoinImp domain names used, we find a total of 4,119 sites. Early in December 2017, I discovered a new form of cryptojacking malware called Minr. What differentiated this from the others is that it provided built-in obfuscation for its users. This wasn’t required however and many sites I found didn’t bother to use it. Example of a site containing Minr malware. 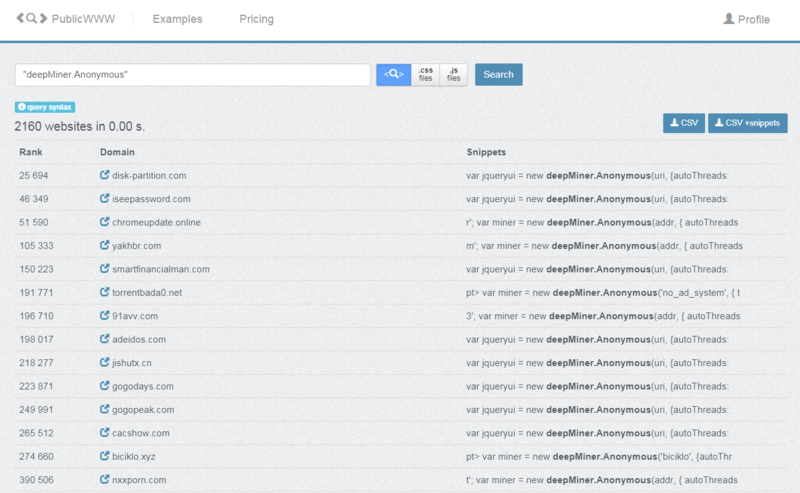 In addition, the domain names used by Minr were innocuous looking. The domain names also frequently changed, so anytime I shared an update it quickly became out of date. The domains used by Minr a week ago (shown above) have again have changed. Totaling the four Minr domain names currently used today, we find a total of 692 sites. Now that we have this information, we can simply search PublicWWW for “deepMiner.Anonymous” to locate the affected websites. This leads us to find 2,160 sites using deepMiner for cryptojacking purposes. One site I found using deepMiner was a fake Chrome update website that advised users not to close the page. 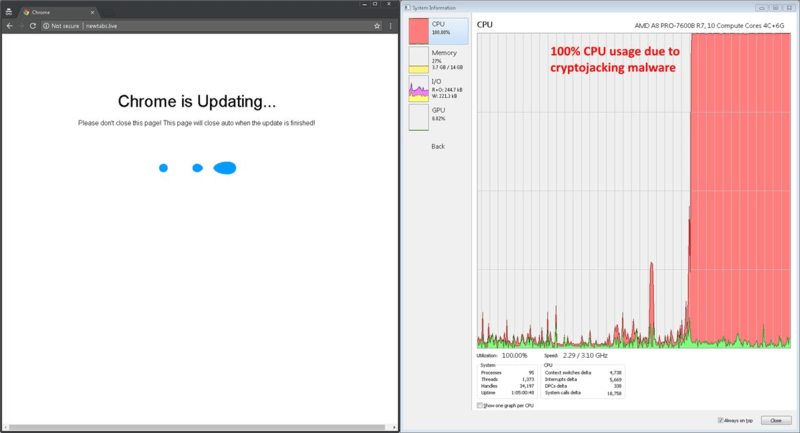 Meanwhile cryptojacking was happening in the background consuming 100% CPU of my test machine. No, Chrome really isn’t updating. Coinhive remains the market leader for cryptojacking malware. However, many clones it inspired are showing exponential growth rates. 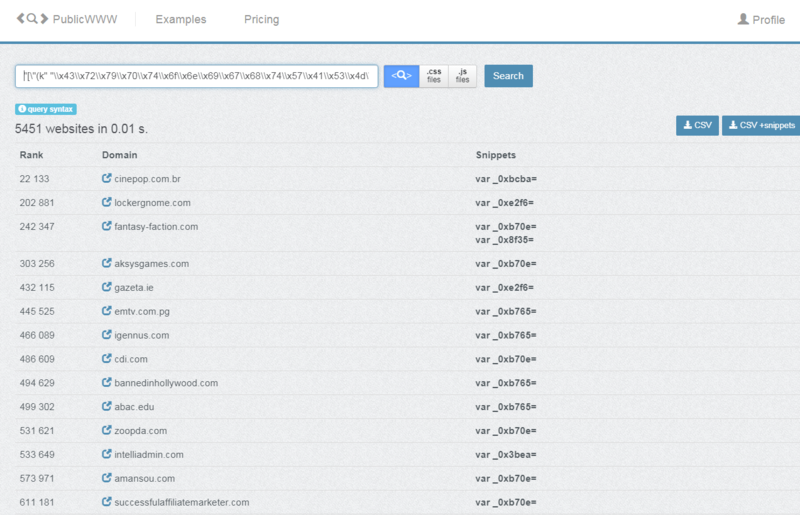 The four Coinhive clones discussed were found on a total of 9,028 websites. CoinImp had the largest market share at roughly 45% while Minr had the smallest at nearly 8%. 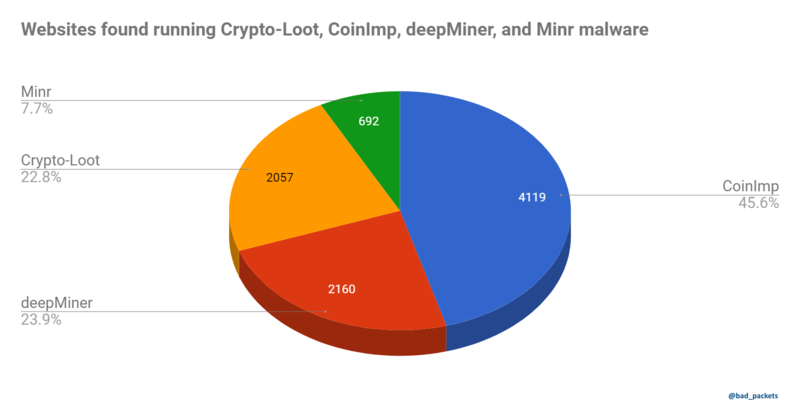 Crypto-Loot and deepMiner shared the remaining portions at nearly 23% a piece. However when compared to Coinhive by itself, the other cryptojacking malware providers only account for a modest 18% market share. I would expect Coinhive to remain in the top spot for the foreseeable future. Coinhive is clearly the market leader when it comes to cryptojacking malware as it’s been found on nearly 40,000 websites. For Chrome users, I recommend using a dedicated extension, minerBlock, to block cryptojacking malware. A Firefox version of this extension is available as well. The cryptojacking malware discussed in this post is only a portion of what’s currently found in the wild. New variants are discovered frequently, which I share frequently on Twitter. You can also browse the CoinBlockerLists, which is constantly updated by ZeroDot1, where you can find hundreds of domains tied to cryptojacking malware. The statistics shared in this post were generated from data provided by PublicWWW on 2018-02-07. They are subject to change as PublicWWW regularly updates their index. It saddens me how in-browser mining is called malware even when it’s not malicious nor is used at any point unless specified by the user. False, cryptojacking does not involve user consent. That’s the whole point. It runs surreptitiously in the background. Next PostNext Mirai-like Botnet One Year Review and a New Website!